For more than 50 years, Bostonians have turned to Boston magazine as a trusted source of news and information to improve their lives. Our content is reliable, thought-provoking, and timely. By advertising in print, your messaging is not an interruption but rather becomes a part of the content. 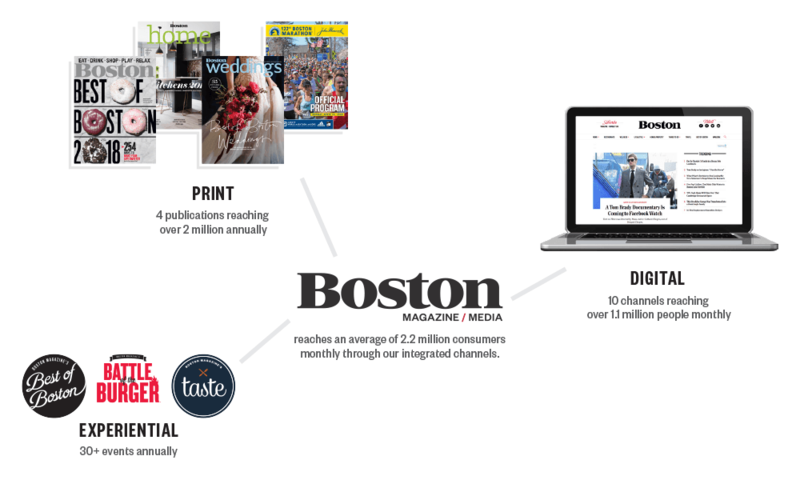 With our digital asset—bostonmagazine.com—we find ways to integrate your messaging with our site with smart content alignment. Plus, with our events, we offer you experiential marketing solutions to provide you with more meaningful interactions with your future customer. Magazines continue to score higher than TV or the internet in “ad receptivity” and other engagement measures. Readers spend an impressive 41 minutes with each issue. Among digital readers, 73% read or tap on advertisements appearing in electronic magazines. Consumers trust and believe magazines — and embrace advertising as a part of the brand experience. In fact, studies show that ads in magazines rank higher in trust than ads on TV, radio or online. Boston magazine is more than just Boston’s leading lifestyle magazine. We are a media company leveraging our powerful print, digital, strategic partnerships, and on-site consumer-facing programs to develop custom, integrated marketing campaigns for our clients. *The total audience measures average monthly audience across Boston magazine, Boston Home, Boston Weddings, bostonmagazine.com and events. Source: Google Analytics and Media Audit 2016.